Morning all. We are in court 26 of the Rolls Building awaiting the start of Day 9 of the Bates v Post Office common issues trial. And we’re underway. Mrs Angela van den Bogerd being cross-examined by claimants QC Patrick Green. It’s her 7th hour in the witness box. Public gallery much quieter than yesterday. QC You would accept there are things that can be done to make Horizon more error repellent? QC pointing out training for SPMRs has changed significantly. It’s gone from 3 days of classroom training in 2014 to 2 in 2015. AB points out that more training elsewhere was offered. QC now onto investments SPMRs make into their branch and notes a PO trainer making a point that SPMRs make a significant investment in their business so their training should be up to scratch. Judge so the incoming SPMR pays an introductory fee to the PO to take on the branch? the Post Office is an introductory fee or a goodwill fee. QC asks if AB would like to reconsider her previous answer to the judge. She does. She accepts in the light of the document they are looking at, the introductory fee is a goodwill fee. QC has brought up an internal Post Office document which has a title in which a single word in the title is redacted under privilege. QC asks if she knows of an internal PO group named after an animal, working on Horizon. Judge asks AvdB to leave the room. There begins a discussion about the privileged information which includes a single word in the name of the project. Judge says he is struggling to understand how a single word can be privileged. then corrects himself to say tells - he is telling the PO QC to review the claim of privilege on the title. He says whoever has redacted the title has decided that a word is privilege. Judge wants to know how. This is the longest stretch of legal argument about a top secret PO programme - a KPI [?] named after a furry animal into the robustness of Horizon. There is some doubt as to whether AB is allowed to be asked about this or not and if so what. Judge invites AB back in, then rises for 5 minutes whilst PO QC takes instruction. This is clearly a very sensitive document. Possibly named after a furry animal. Judge is back. PO QC will not object to Mr Green’s line of questioning as presented. AB is asked first of all about three names on this document. Author, reviewer, review and sign-off. Does she know who they are? Are they lawyers? QC back to the document System? and KPI is robustness of the system? QC the H system generally? QC says isn’t the reality that the Branch Support programme existed to deal with sensitive issues around Horizon which is why you only mentioned it in passing despite the fact the issues you dealt with are of central importance to this case. QC Post Office can through Fujitsu? Judge asks QC to move on. He says he was going to. QC asks about the SPM being bound to account to the SPM. How does the SPM account to the PO through for their actions? QC but on H they have no choice to dispute. QC let’s say a TC creates a gain that an SPM believes they are not entitled to. They have to accept it and then raise it. If they take that money out, is it wrong? AB but having done that they can then dispute it through the processes. QC you say giving SPM access to all branch data would make it completely unworkable. You say one of the benefits of the relationship is that Post Office handles all this on behalf of the SPM. Do you stand by this statement? PO QC stands up and starts his re-examination. He goes back to the JFSA QC’s hypothetical situation of a £9K loss she was given on Monday afternoon. PO QC suggests she was not happy with this scenario because it just wasn’t realistic. AB says they work by looking at the wider perspective - looking for warning signs before carrying out an audit. AB period of weeks - they’d usually be aware of it. PO QC moves on to letters demanding payment from Pam Stubbs. reminds AB that she said these were automatically produced demands. PO QC says it was put to her that this was a deliberate attempt to collect more money than you’re entitled to…. AB I read into this that she accepts this is the sort of thing she’s going to get every month. But we should have put it on hold and we should have stopped the letters going out. PO QC it was suggested to you that there was no document which tells a subpostmaster they can settle centrally rather than settle to cash. … and funds recovered. Wants to know if this can be read together with the clause the PO QC read out. Judge and this relates to the recovery of money through SPM pay. PO QC asks AB what the purpose of a TC at a v basic level. PO QC asks about a 2011 functionality being introduced. JFSA QC objects - she’s already says she doesn’t know. PO QC asks about the resolution of the payments mismatch error discussed yesterday. It is a letter from Womble Bond which outlines how this payments mismatch was resolved. PO says on reading this are you satisfied all the SPMs were informed? AB all the SPMS were refunded or not held accountable and all those who had a surplus were allowed to keep it. PO QC taking AB through correcting branch errors on Horizon procedures as outlined in PO documents, how to dispute. etc Would that be helpful to an SPM? PO QC now onto camelot training “good’ and horizon training “not so good” - what does this relate to? … in the Complaint Review and Mediation scheme. AB completely independent investigators brought in to look at the nature of each complaint and asses what caused the loss. Judge raises difference between SS’s assessment of thematic issues and PO’s view it was completely discrete and separate problems unliked. Judge - is that still your view now? AB’s explanation is that they took these things as themes and investigated and found that things SS thought were different were in fact not issues. Judge - so you don’t see there are any thematic issues at all? … which may have some overlap. Judge asks did you understand there was a restriction on the length of your WS? Judge so you judged the length of your WS yourself? Judge now asking about supporting information which can be sent in by SPMs to challenge TC evidence. This is presuming there is enough time before the rollover to do this. Judge talks through the process in the PO document and suggest that from his understanding the moment something is settled centrally it starts an automatic debt recovery process unless it is stopped. Judge asks what is the difference between a suspense account and settled centrally? AB suspense account sits in the branch, settle centrally takes it out of the branch with the SPMs name on it. PO QC back on his feet making a point about the judge’s question on the length of her WS. Says you set out your own scope in terms of relevance? PO QC did you get advice on that scope? PO QC asks about judges question on settle centrally debt recovery automation and disputing a TC. We take a break. AvdB is leaving the witness box and the court. We’re back. Timothy Dance from the Post Office is in the box - I’m not going to get his statement till lunch, I think. I tell a lie a very nice lady from WBD has just walked his statement across the court to me. Although he’s just been told to speak more slowly and keep his voice up! Mr Dance has been told to slow down and speak up again. I’m only saying all this because we’re still talking about his job role. Ah now we’re on to Mr Sabir (lead claimant) and his business plan. And we’re on to a website which another lead claimant Liz Stockdale used to make her business plan. It’s a PO website. KD notes none of the links on that website links to the SPM contract. KD why the need to sign a document? Sorry this chap in the witness box is called Timonthy Dance and he is the Retail Transformation Integration manager. TD has had permission to look at Louise Dar and Liz Stockdale’s business plan in order to prepare his WS. TD says LD and LS are the most recent examples of biz plans. Have you seen the other lead claimants? relating to the other lead claimants? Have you looked at them since writing your WS? KD v different aren’t they? KD asking about when proforma biz plans TD has studied and which period of time they represent. TD says they represent a period of time wider than the day they completed, but he can’t say how wide. … ranging disclaimer making clear that this proforma biz plan is essentially a dummy and cannot be relied on. KD its’ quite defensive isn’t it? KD why does it have to be expressed in this way? KD onto email sent to Louise Dar by the PO saying she may copy the business plan they are sending her for her application to run the Lenzie Post Office. Notes the disclaimer has become even more comprehensive on LD’s proforma biz plan. Asks if the additional clauses in the NT biz plan proforma is unique to biz plan proforma. … between the proforma biz plan sent to LS and the one sent to LD? TD - no unfortunately they’re not marked so I can’t tell you which one came first. KD would this be a convenient moment, my Lord? He rises. We are back after 2pm. I am going document hunting. mentions And we’re back in the room. Kathleen Donnelly for the Postmasters cross-examining Timothy Dance from the Post Office. KD asking him about the NFSPs involvement in negotiating the terms of the NT. Why did you put this in your WS? KD what involvement do NFSP have in biz plans? mentions Judge asking if NFSP were aware of what is in biz plan info? Judge - what does very visible mean? TD no cos SPMs would take biz plans application to NFSP sometimes. mentions KD on to cover page of biz plan sent to Mr Alan Bates [lead claimant]. KD now reading out bumf from stuff sent to prospective SPMs back in Alan Bates day [late 90s]. It is chummy bumf telling people how to sell stuff and profit budgets. This is basic stuff. … were quite commercially naive. TD disagrees and says that this is just about giving as much info as possible. “commercially naive”. It was used by the PO QC to every lead claimant suggest to all of them that they weren’t “commercially naive”. I suspect this phrase has a lot of weight in law. KD notes that the draft biz plan for late 90s applicants had an example of a profit budget and nowhere for losses. KD this is because the PO expects them to be commercially naive? KD going through the examples in the proforma business plan. This is could give the impression of being a comprehensive business plan? Judge intervenes - would you like to put that question for the THIRD time? KD This example could give the impression of being comprehensive? KD but there’s no line for losses? KD going on about the range of business plan proformas in circulation - suggests it’s a bit of a mess. KD what BP should mr sabir have got in 2006? KD but he didn’t, did he, he got the 2003. So it’s not robust. … there might have been a good reason for this. KD goes back to the language of another document. Makes point that the language is touchy-feely for inexperienced types, it is a tool FOR SPMRS and the PO slaps massive disclaimers everywhere on it. KD she says the loss line expects a £1500 loss in the first year. Is it true the PO expects the SPM to make a £1500 loss in the first year. Notes it is the same for Mr Abdulla’s application. TD says its a risk assessment and starts waffling. Judge - would you like to ask your question again Ms Donnelly…? KD why would you withhold the information. Is it fair? KD but this document isn’t new to you. Did you not try to find out? TD no because it was before my time. … a business plan without a line for losses. KD so it’s important to include a line for losses. It’s a cash business. I thought it needed to be included. Judge - so was this your idea? TD - losses and retail shrinkage, yes. KD asks if any of the guidance sent out drew attention to the things we need to be thinking about? Now talking about Louise Dar’s business plan - which came in after TD made changes to the BP. It has no provision for losses. Why not? KD Why don’t you know? You just said it was important to have a line for losses in there. KD so when a plan did have losses in as a line - there was no guidance on what they might be and when there wasn’t there was still no guidance. KD has finished. David Cavender QC for the Post Office is on his feet for re-examination of Timothy Dance. He is looking back at the list of expenses in one of the PO proforma BPs. Are there any gaps in this information? TD it depends on the size of the business. It’s very difficult to have a one size fits all. PO QC but would you need to ask further questions to ascertain how comprehensive it was. Judge asks about BPs for Mrs Dar and Mrs Stockdale. and BPs for Mrs Dar, Stockdale, Messrs Sabir and Bates. Judge trying to clarify what TD had or hadn’t seen of BPs. Judge points out he contradicted himself in 90 minutes. When did he see Mr Bates BP? TD has been stood down. The next witness I think will be Helen Dickinson who deals with fraud risk and dishonesty in branches for the Post Office. …. Those that do commit acts of dishonesty are not necessarily “bad” and often don’t have histories of dishonesty.” goes on to talk about the Fraud triangle then adds “problems start small and then grow into larger and larger frauds." QC raising an example where a large discrepancy is raised and settling to cash or settling by cheque is difficult. Cos if you can’t get the cash you’re stuck, and if you don’t have funds for a cheque you are committing an offence. QC talking about a lack of a dispute button on Horizon itself. There isn’t one is there? HD can’t answer that. Don’t know. QC you are an investigator. you learned how to trace assets and recover them through Proceeds of Crime Act. QC and you have done this on behalf of Post OFfice. QC and to get an order under that legislation you have to get a conviction. How many cases? HD I was aware if they disagreed they could settle centrally and dispute after. QC did you know it was treated by PO as a debt the SPMR had accepted? HD my understanding was that it was parked there to be discussed. QC asks HD about paragraph in her WS which sums up the SPMR’s bind. I will write it up in today’s blog post because it shows an understanding of the false accounting dilemma perfectly. QC is going back to Louse Dar’s cross-examination in which she talks about being told to essentially false account by the Horizon helpline as a work-around. QC would you believe if if you heard an SPM say they’d done this on advice? HD I’d have to know more about the circumstance. Goes to document about widespread dissatisfaction with Horizon among SPMRs and notes a line in which an investigation found widespread workarounds and non-conformance to rules. Was she aware of this? QC goes on to change in policy on suspending Subpostmasters which changed in 2014. 33 currently suspended - 112 kept in post who would have been suspended pre policy change with £552,000 made good which would otherwise become agent debt. QC now going to August 2015 letter to Louise Dar which explains her non-suspension to her. then a total of 3 people over the next 4 years. QC asks if this was a recognition within PO that their previous policy was wrong. HD it could be because of the drop in suspensions. we would only investigate matters for criminal ends if the SPMR had been suspended. If they’re not suspended we wouldn’t get involved. QC were prosecutions made so that the Post Office could recover assets? HD in some cases, yes. Final Post Office witness of the day takes the stand Michael Lee Shields, a Contracts Advisor. PO QC currently just going through slight corrections to his WS as requested by the witness. Another silk asking questions for the claimants. A Mr Henry Warwick. He is, according to his website: "user-friendly, very bright and very thorough." His chambers’ website, to be more accurate. We are still fact-checking MLS’s WS. Asking about changes to chronology to his WS. HW asks if there’s anything else he wishes to now change in his witness statement or is the rest of it completely accurate? HW establishing that MLS’s evidence relates to the period post-2015. HW asks if he’s had any involvement with the lead claimants? 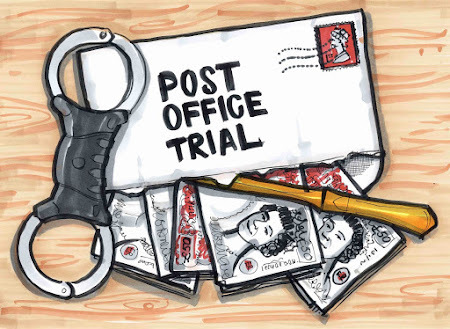 HW were you a Subpostmaster in your career? MLS basically appoints temp SPMRs. HW are you aware of the differences between the SPMR contracts and the temp SPMR contracts and how they are appointed. We go to the contracts. HW is pointing out differences in the contract when it comes to the new arrangements for new SPMRs. You have seen this before? HW comes to the NTC local contract. Have you seen this one? HW asking about what happens during suspension. have you seen this provision before? HW [reads from NTC contract which talks about a substitute] what is a temp Subpostmaster? Are they effectively a substitute? MLS never heard the word substitute used before, but yes that's what the wording means. HW going through the contracts and MLS, I'll be honest, is not very familiar with the contractual basis on which he operated. HW asks if PO is happy for a staff member to step up to run a branch in case of death in service, but they’re not happy if it’s a suspension. Sometimes temp SPMRs will run a branch in their absence. They are allowed to do this in case of death in service. Also PO will let staff run branch without a temp. But with suspension the PO insists on a temp being in place. Why? MLS gives answer, but I’m not sure I understood. That’s it for the day we are back at 10am tomorrow! I also just want to issue a clarification - the last question asked of Helen Dickinson was actually “were the cases referred to the investigation team so that you could trace their assets through POCA”? to which Helen Dickinson replied “In some cases, yes." This makes the meaning of what she said less clear to me but those are the words that were said. If they are feeling particularly committed they can donate to support my work too. There is a button on the website which links to a paypal site which will take your card details. Donations of more than £20 will be added to the secret emails list!